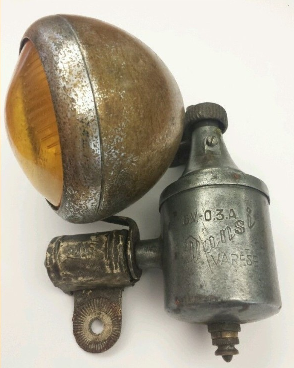 Armando Dansi and his company made bicycle generators and lights in Varese, Italy, since the 1930’s. 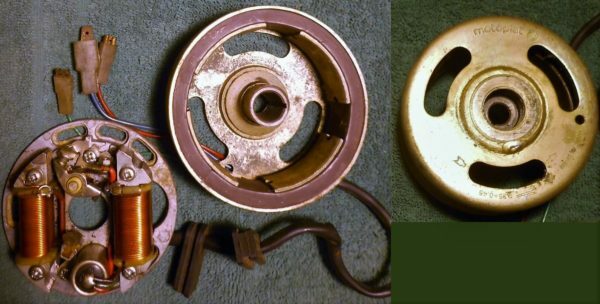 Dansi magneto generators (power dynamos) were on 1950’s to 1970’s Italian small motorcycles and mopeds, such as Aermacchi, Benelli, Cagiva, Fantic, Italjet, Lambretta (Innocenti), Lem, Malanca, Rizzato, Zannetti, and non-Italian mopeds such as NSU Quickly. On US model Italian mini-motorcycles 1965 to 1980, Dansi magnetos were original on engine models Benelli, Morini S5K2, and others. 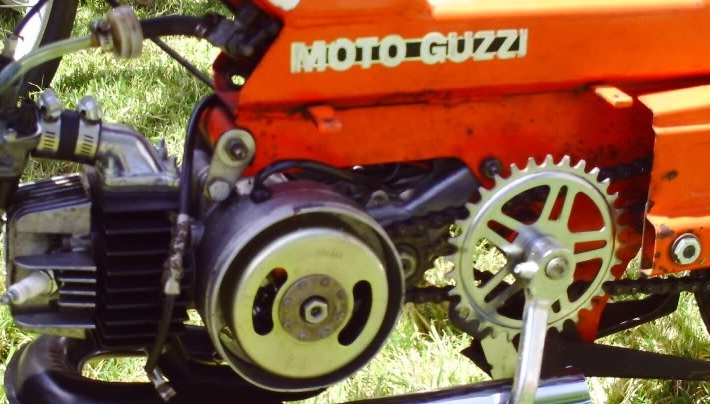 On US-model mopeds from 1975 to 1985, Dansi magnetos were on Morini MO, MO1, MO2, MO4-B and some M1 engines. There are two types of Dansi magnetos for 1975-85 pedal mopeds with Morini engines and with brake lights. The US DOT required that mopeds must have brake lights, and that the headlight must not get dim when the brake light is on. One solution was to power the brake light from the ignition ground. This gives a brighter head light, but the engine can loose spark if the brake light wires become loose. The other solution was to power both head and brake light from the same coil, by making a center-tap ground, so there are two concentric coils with one core. This makes the headlight always dimmer, but the engine never looses spark because of the lights. Some moped brands used only one type. Most brands used either type. That created confusion. 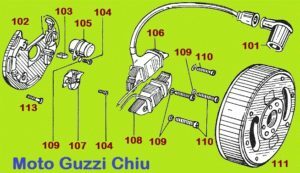 To make matters worse, most US moped brands with Morini engines did not explain the brake light wiring, because their manuals were originally written for European models that did not have brake lights. Many of the parts lists have omissions or mistakes, because the equipment (magneto and brake light) was changed late, to meet US laws, after the manuals were translated and printed. 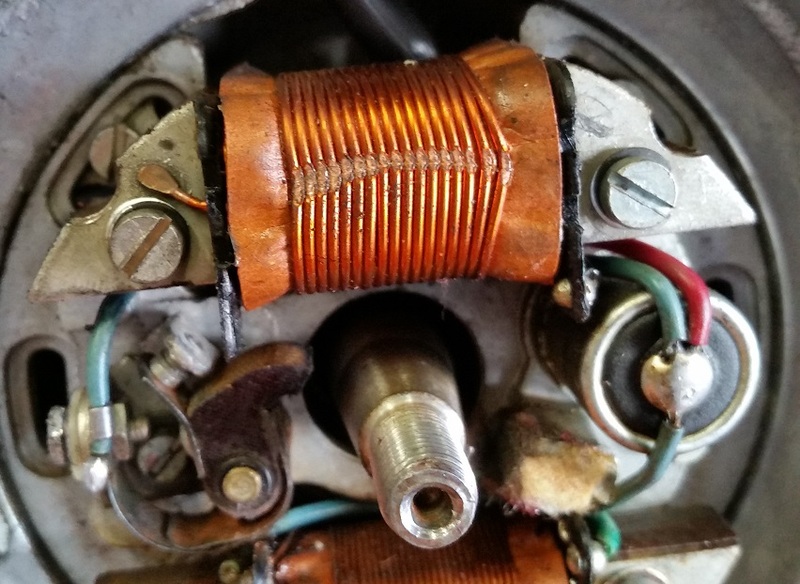 Because of this, no one can say what all the wires are, on most US-model mopeds with a Morini engine, just from the make, model, and year, without knowing what the Dansi number is on the flywheel. 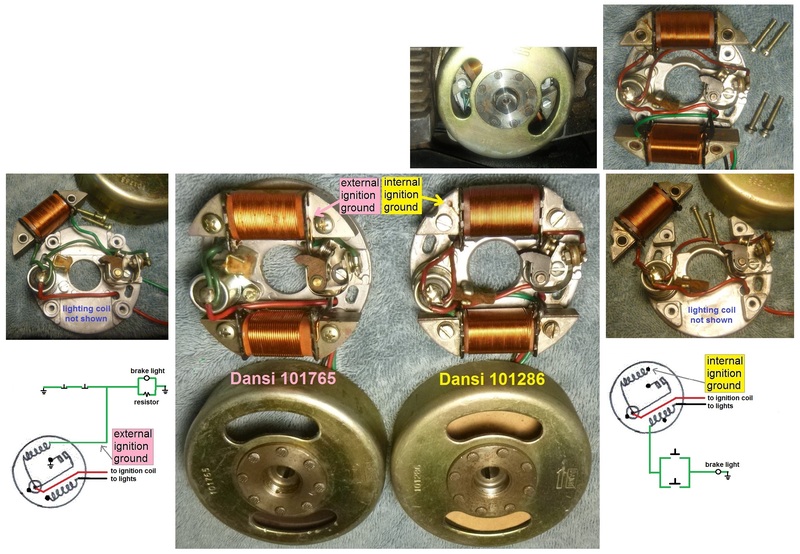 Below is a photo mosaic comparing the two types of Dansi magnetos for mopeds. The left half is 101765 “external ignition ground” type. The right half is 101286 “internal ignition ground” type. On a moped with a Morini engine, the number on the Dansi flywheel tells 1) what magneto it has, external (101765 or 101732) or internal (101286) ignition ground, 2) what brake light wiring the bike has, series brake light switches (9342 normally closed) in parallel with the light for 101765 or 101732, or parallel brake light switches (9343 normally open) in series with the light for 101286, 3) what CEV 9530 tail light version it has, one with a brake light resistor hidden inside (101765 or 101732), or with no resistor (101286). This matters a lot when troubleshooting a bike that has no spark. Bikes with external ignition ground often loose spark because of a loose brake light wire. On those you always ground (connect to the frame) the green magneto wire first, and then re-check for spark. That way you will know if the problem is external, in the bikes wires and lights, or internal in the magneto, such as dirty points. 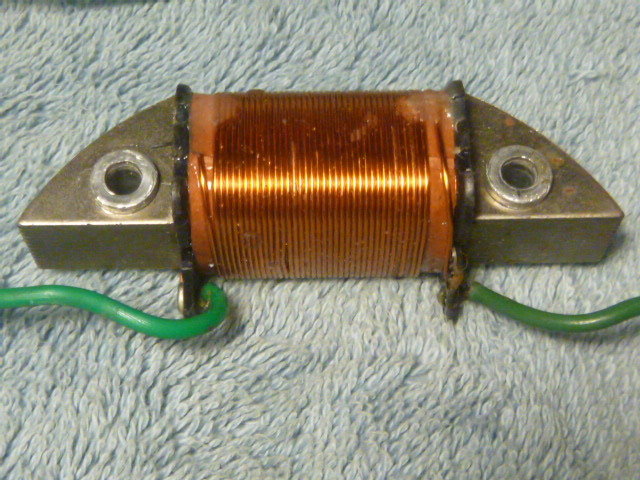 M27 coil: Because the service manuals did not mention the “external ignition ground” troubleshooting procedure, where you ground the green wire to get spark, many people have replaced the coils, both the internal M27 ignition source coil and the external spark coil (transformer), when they did not need them. As a result, the supply of M27 source coils has ran out. M44 plate: The M44 stator plate bare (for 101286) and the M44A (for 101765) have different part numbers and different felt wipers, but they do interchange. 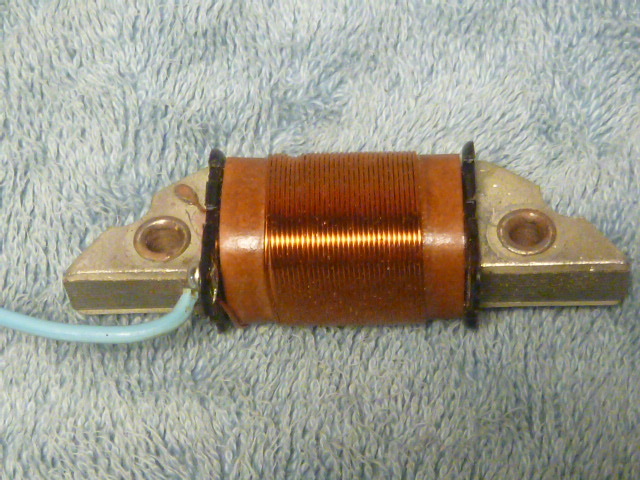 The M44A has no cut-out for a internal transformer spark coil, and so is a later design. The M44A is made stronger. Here are the bolt hole (4mm) spacings for various moped source coils. Lower generator coil is lights, upper coil is ignition. 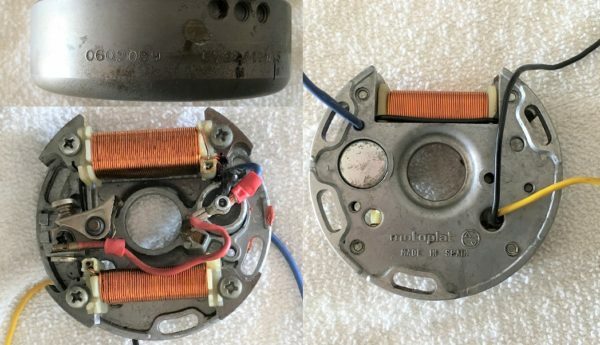 From this list, there are three moped source /generator coils (in Myrons Mopeds inventory) with 47mm hole spacing: Ø80 x Ø80 Dansi, Ø80 x Ø80 Bosch, and Ø80 x Ø79 Motoplat. So an ignition source coil from a Batavus or Trac M56 would “drop right in” and fit perfectly. But the edge is farther farther from the flywheel magnet. So the spark would not be as strong. It would be OK going fast, but when idling it might loose spark. The spark plug gap could be reduced to compensate. In the photo, the distance is measured, from edge of the 4.0mm hole to the edge of the steel plates. Dansi is 5.3mm, and Bosch is 3.9mm. You can see the difference is 5.3 – 3.9 = 1.4 The Bosch substitute is 1.4mm farther away from the moving magnets. 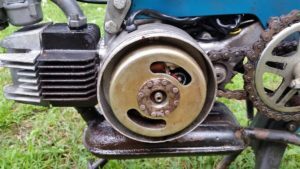 The late 1970’s Dansi steel magneto flywheels for Benelli look like the late 1970’s Morini ones, but the rotation is opposite, clockwise and the stator plate is very different. The stator plate has 5 mounting slots, not two, and is larger. 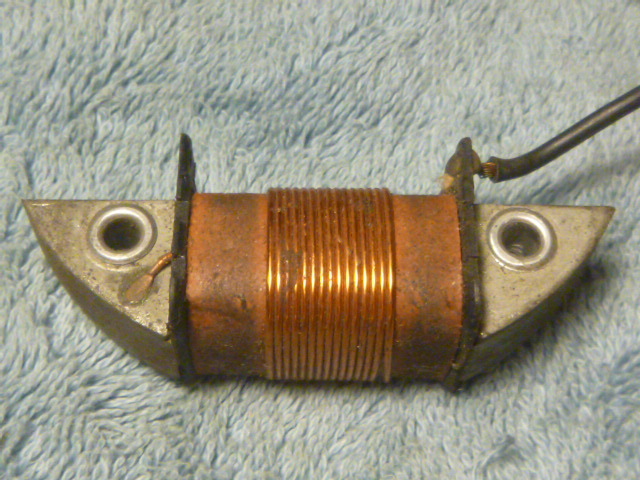 Unlike the Morini kinds, the upper coil is lights and lower is ignition. On a 101813 the ignition coil has an external ground, the green wire. It must always be grounded in order to have spark. The green wire powers the brake light. Normally the brake light switches are closed, taking all the electricity from the brake light. Opening either brake light switch causes the brake light to go on, opposite to all normal light switches. Normal light switches close to make the light go on. Think of it like turning off your shower, by turning on the garden hose. Note how the case is for the older bigger flywheel. This has a performance cylinder, intake, exhaust. The Benelli Blazer was the USA version of the Benelli Bobo. The Moto Guzzi Robin (sheet frame) was the USA version of the Moto Guzzi Chiu. The Moto Guzzi Robin (monotube frame) was the same as the Benelli G2. All of these have the same Benelli 0ne speed automatic engine with pedals. 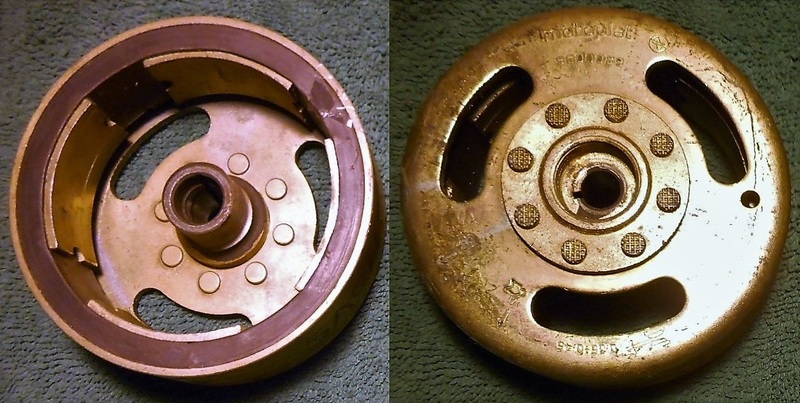 The stator plate has two upper mount screws and one lower. The upper lighting coil is notched for the screw installation. The lower ignition coil is not notched. 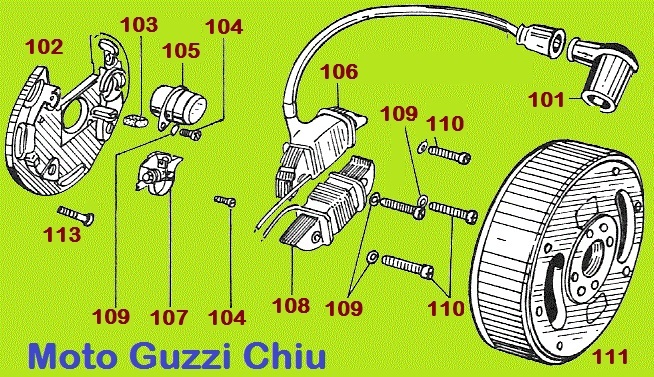 The Moto Guzzi Robin with stamped sheet-metal frame had either a Dansi 101813 external ignition ground magneto, or a Dansi 101441 internal ignition ground magneto. The orange one above with 101813 had normally closed brake light switches connected in series, so the brake light was normally shorted out, until either switch was opened. If the green wire became disconnected, like when the brake light wires were unplugged, the engine would not run. The blue one at left with 101441 had normally open brake light switches connected in parallel, so the brake light did not get power until either switch was closed. If the green wire became disconnect, the engine would still run. What this table of part numbers tells us, is what things are the same, on different moped models, and what things are different. It does not say how they are different, only that they have different part numbers. A is the greasing felt, lube every 3000 mi. 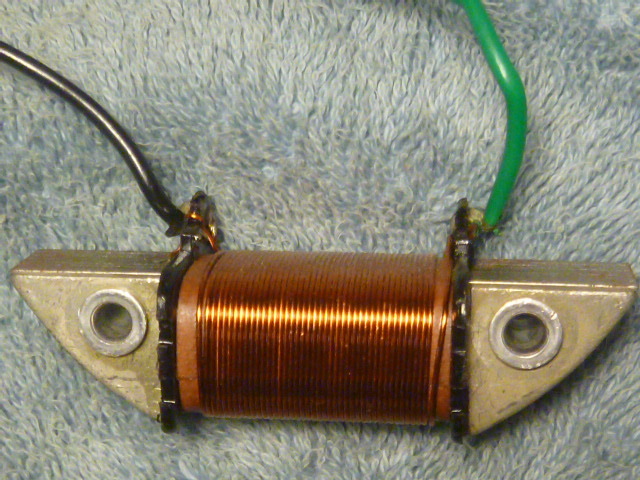 This shows the fine windings of the 25 watt lighting coil, and the layout (lighting coil at 11 0’clock and ignition coil at 5 o’clock). This suggests that 1977-78 Benelli G2 had 25 watt lighting coil (plus 10 for brake light), with thin windings, Dansi 101??? magneto. But the photo above shows the 1979-80 Benelli G2 had thicker windings, Dansi 101813 magneto. Since the lights were the same, the watts had to be the same, 25 watt lighting coil plus 10 watts borrowed from the ignition source coil, for a total of 35 watts of 6V AC lighting power. This has a reverse color coding, blue is ignition, black is ignition ground. The bike wires blue and black are also reversed. You are currently browsing the archives for the Dansi category.